We don’t know about you, but our vision of a futuristic, robot-ran society has always entailed a bunch of highly specified machines performing everyday tasks, each a small but important cog in a greater, greased machine. We see that to some extent today — Roomba robots that emerge from their docking stations to sweep up the floor, industrial Kuka robots fitting parts onto automobiles — but there are still tons of tasks left undone. Every now and then we’re teased with specialized examples, like the laundry-folding robot, but for the most part, these robots remain elusive. Who’s going to water my plants when we’re gone? The answer could lie in a modified version of the Hexa robot developed by Chinese roboticist and founder of the robotics company Vincross, Sun Tianqi. In 2014, Tianqi started an installation called “Sharing Human Technology with Plants,” which explored exactly what it says on the tin. 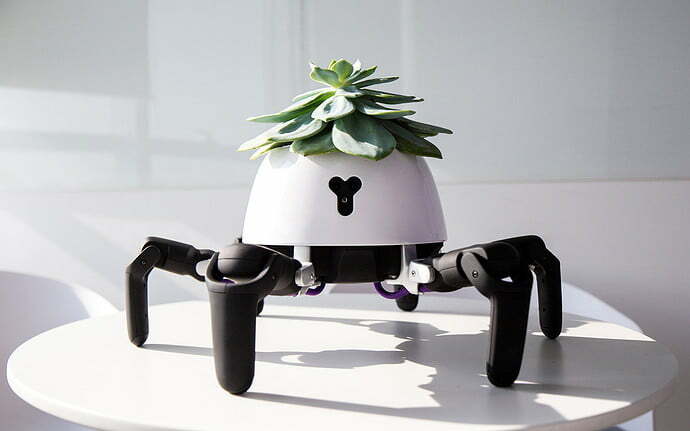 Taking that project further, Tianqi later programmed his spider-like Hexa robot to carry a succulent plant on its head, moving toward or away from the sun to make sure the succulent has adequate access to light. More than just a guide to sunlight, the modded Hexa can let its human knows when the plant needs water by stomping its legs in a little dance. Hexa is a programmable, spider-like robot that’s both adorable and robust, meaning tinkerers can modify their own Hexa’s as they see fit. But be warned: Hexa models aren’t cheap. The basic version costs $950 — and that is before the programmed modifications. Published on Fri, 13 Jul 2018 22:25:37 GMT, © All rights reserved by the publisher.